I love avocados!! I love them almost as much as chocolate.... almost. I had one lying around about to go bad so, rather than using it as a homemade hand cream, face or hair mask (yes, you can! ), I decided to put it to better use and substitute it for mayo in a potato salad! I planned on having veggie burgers for dinner, so the timing was perfect. I threw together a bunch of veggies I would normally use in a regular potato salad and blended the avocado to go on top. 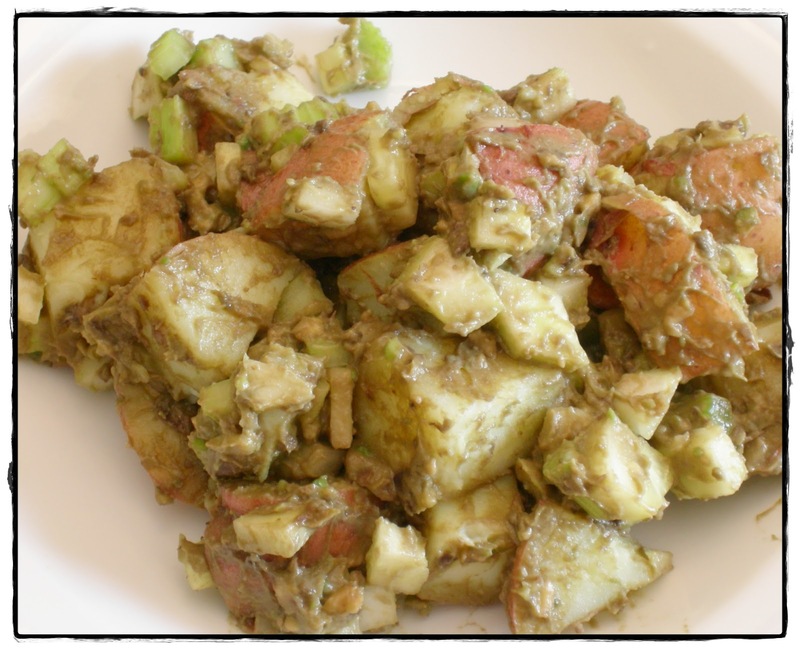 Combine potato chunks, celery, cucumber and onion in a medium bowl, set aside. Combine avocado flesh, lemon juice, salt & pepper in a blender/food processor. Blend until smooth. Top potato/veggie mixture with avocado mixture and stir to combine. While the picture is not so pretty since my avocado was already going bad (notice it's not bright green, but darker?? ), the taste is delicious! I love avocados and potatoes, so I bet I'd love this!